It is with sadness and many memories that we announce the passing of our mom and grandma on Jan. 11, 2019 at Country Meadows PCH in Neepawa. Mom is survived by her daughter Debbie and son Grant (Jo-Anne), grandkids Kelly (Kyle), Rob and Craig, brother Garnett Kolesar of Kelowna, BC as well as numerous nieces and nephews. Mom was predeceased by her husband Dennis, her parents Elsie and Steve and siblings Ruth, Harvey, Tom and Bernard. Mom was born June 19, 1924 in Springhill, where she was raised and schooled. As a young woman, she moved to Neepawa where she held various jobs until she met dad and they married in 1952. In 1955 they were blessed with the arrival of daughter Debbie, followed by son Grant (Hymie) in 1958. As well as being a homemaker, she was secretary/bookkeeper for Dad's business. 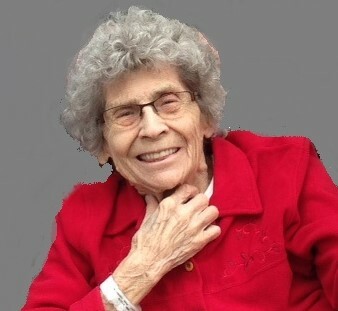 She enjoyed bowling, fishing, cards, as well as her volunteer work (many years at East View Lodge PCH, Meals on Wheels, Brownies). Mom and Dad enjoyed the cabin at Sandy Lake for many years, as well as travelling and the odd gambling trip (5 cent slots only). She enjoyed the many hours spent watching and playing with the grandkids as they grew. She was especially pleased when Kelly and Kyle were married this past August and she was able to take part in some of the festivities. Cremation has taken place. Private interment will follow at a later date. If friends so desire, memorial donations maybe made to Country Meadows PCH or a charity of your choice. Mom/Grandma we are going to miss your feisty spirit; that no doubt allowed you to live 94 and a half years on your terms.